Imagine if you were sterilized – your right to have children taken away forever – without even knowing it? That’s what happened to about 16,000 of Japanese people. The Eugenic Protection Law of 1948 allowed prefectural review boards to decide on eugenic surgeries. Waseda Chronicle has obtained the minutes of board meetings in all Japan’s 47 prefectures. The review board members included the executives of local communities, executives of local medical associations, judges, and prosecutors. Vice governors, directors of prefectural health departments, district judges and prosecutors, heads of local police, medical professors, heads of prefectural medical associations, practitioners, experts, and caseworkers were all encouraged by the government to join the boards(*1). Some members raised awkward questions about the system, with its echoes of Nazi eugenics, and pointed out possible violations of basic human rights. But all still went along with the system and voted on multiple sterilizations. In this article, we reveal the decision-making mechanism of how stakeholders decided on eugenic surgeries. Many cases reveal a callous disregard for the lives of the people being discussed. Related article: [Forced Sterilization] How Japanese cities competed to sterilize the most number of disabled people, under request by the health ministry. 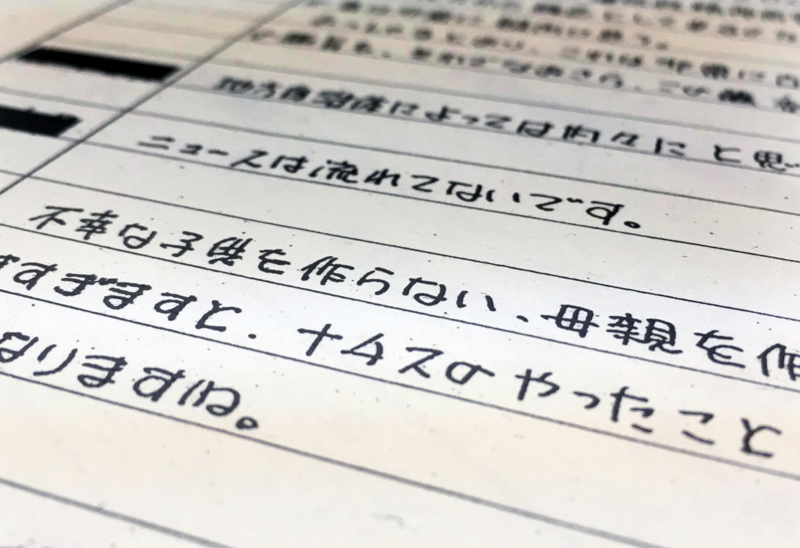 Hokkaido Prefecture boasted its numbers by publishing a letter to commemorate the milestone to surpass a thousand surgeries. Forced sterilization surgeries: Article 1 of the Eugenic Protection Law states the law’s purpose is to “prevent the birth of defective descendants,” as it applied to people who had hereditary genetic disorders or disabilities such as schizophrenia, learning disabilities, manic depression, epilepsy, and hemophilia. The surgeries were conducted regardless of whether or not the concerned individuals gave their consent, as long as the relevant Eugenic Protection review board set up at the local government level gave a green light. Doctors were required to report to the review board when they found a person with hereditary genetic disorders or disabilities, according to article 4 of the law. Doctors were also allowed to use anesthesia, physical restraints, or deceive individuals who were non-compliant, a notice sent to local governments by the health ministry said (Dated October 24th, 1949). This meant that if individuals refused to undergo a sterilization surgery, doctors were allowed to not only physically restrain or anesthetize, but trick them into the operation. For men, the surgeries involved vesiculectomy, while for women, it involved tying the fallopian tubes to block ovums from passing through. Source: Saburobei Nakayama Modern Obstetrics and Gynaecology Encyclopedia Vol. 9 Infertility and Contraception (Nakayama Books, 1970)/ Eugenic Protection Law Enforcement Regulations. 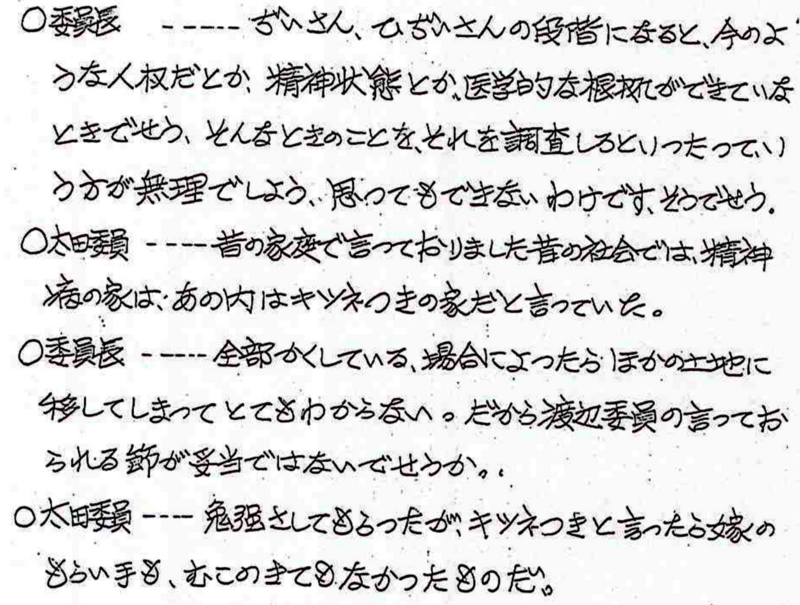 DISCLAIMER: Documents obtained by Waseda Chronicle include discriminatory expressions. In order to illustrate the situation fairly and accurately, we refrained from editing or censoring them. On Dec. 10, 1969, Yamaguchi Prefecture review board met to debate the forced sterilization of 14 people. During a discussion about the sterilization of a child with a mental disability, a committee member pointed out a potential human rights violation. The document we obtained has blacked out the name and affiliation of this committee member. But in the end, the board voted for the procedure with “no objections” from all the members, including the person who expressed the concern. Ten years later, on March 12, 1979, the board spent two hours on the cases of five people at the prefectural assembly building. One of the people, a woman, suffered from suspected mental and physical disabilities, and her physical movement was limited to a crawl. Still, one committee member challenged the case. Again, the forced surgery eventually went ahead without a single no vote. The third person on the agenda that day was also considered mentally disabled. Some questioned whether…”anyone would think she has the mental capacity to decide if she wants to have a child (given the levity of her mental disability).”(*2) Others suggested her family might take care of her babies. Yet, again nobody objected to the case when they voted on it. The department in charge of the Eugenic Protection Law in Tottori Prefecture presented a report about a woman with a suspected mental illness on Nov. 29, 1978. The report was created based on hearings they conducted with her father and teacher of her junior high school days. Eight board members, including the chairman of the prefectural medical association, met at 2 pm on that day to discuss this report. Kozo Shuto, a deputy prosecutor and a board member, asked what this meant. “So are you saying it would be problematic if a stupid person bears a child? Is that your definition of public good?” he asked. “Heredity is very complicated. We say we only live to 50 years old, but we lack hereditary information before our grandfathers even after tracing our family trees. We have to assume that mental illness is inheritable if even one member of the family suffers from it. We should not think too strictly about the causal relationship,” said Hajime Watanabe, a psychiatrist. “In the past, if a household had one family member with a mental illness, the family was said to have been haunted and cursed. And their daughters could not marry nor take a husband,” said Jitsutaro Ohta, the president of the prefectural social welfare council. Then the topic moved on to the ability of the mentally disabled woman to raise children. “Even if she gives birth she probably cannot raise the child. [Life] would be miserable for the child if it grows up in such an environment,” said Masako Nakata, a lawyer. “We would not know the father, and it’s unclear if the father would acknowledge the child. There might be several potential fathers,” said Hajime Watanabe, psychiatrist. “So the child will be most miserable,” asked Masuo Murae, the chairman of the prefectural medical association, and chair of the board. “Yes, that’s right,” said Nakata. “So do we all agree that we will approve the procedure as the board?” said Murae. “No objection,” said all the members. Nobody objected to the notion that “the common good would be undermined” by an “idiot” having a child. Despite the lack of clarity on whether mental illness was hereditary, the board concluded there was no need to think about the issue further and unanimously decided the woman would not have children. The Chiba board examined the case of two people on July 1, 1958. The names and ages of the participants are blacked out in the documents. The meeting was convened at 1:30 pm. After hearing a report on the first person, the board members voted for surgery without discussion or objection. The second case was expedited in the same fashion: quickly and with no objections. They adjourned the meeting at 1:50 pm with an introduction of the bios of the doctors who would be conducting the surgery. This means that the Chiba board spent just 20 minutes to make decisions about the most intimate matter of two women’s lives. An obstetrician in Fukuoka Prefecture reported the case of a 22-year-old woman on Jan. 28, 1982, citing hereditary mental retardation. The diagnosis attached to the report is as follows. Progress of the condition: The subject has been mentally retarded since she was a child. She finished middle school where she was put into a special needs class. Her speech and language ability was severely underdeveloped. She easily gets tired of things and rarely sticks at anything. She was seduced by men and had repeated abortions, fathers unknown. She married in 1981 and gave birth but put the child into foster care as she was incapable of raising it. Current condition: She has an IQ of 45 and suffers from mild mental retardation. She is very childish and easily influenced by others, which makes it harder for her to have a normal adult life. The report said her father, mother, younger sister and aunt were suspected of suffering from mental retardation. Yet, the review board meeting could not be held due to scheduling conflict of the board members. So the prefecture went ahead and asked the board members to review the case only on paper instead of convening a meeting for discussion. The board members included the chairman of the prefectural medical association. The board members were only required to write down “approve” or “not approve” on the paper without any comments. All approved. According to minutes of a eugenics board by the health and prevention department of Fukuoka Prefecture, eugenic surgery was decided for six people without a proper review board meeting. Instead, they circulated documents among the members asking them to write down their decision. Waseda Chronicle has obtained the minutes for 1980 and 1981. Those five people under review were the 22-year-old woman, three other women aged 39, 19 and 29, and two men, aged 22 and 27. According to the minutes, the health and prevention bureau failed to properly discuss a 39-year-old-woman as “the prefecture could not hold a review board meeting in a timely manner.” It’s worth noting that the board took more than six months to make a decision after simply circulating and signing a report by her doctor reporting the case on Aug. 8, 1980. Surely a meeting could have been held sometime in the six-month period? Nobody on the board questioned this procedure to decide on the most fundamental right of women – her reproductive ability. This is despite the fact that the decision went against the government’s own rules, which stipulated that boards should meet to discuss such cases. The vice health and labor minister sent out a notice to the all the prefectural governors on July 12, 1953 pointing out the inappropriate nature of the pass-along system to make decisions(*3). In 1948, three years after World War II, Japan enacted the Eugenic Protection Law, which allowed the state to forcefully sterilize mentally and/or intellectually disabled people. In 1996, the law was amended into the Maternal Health Act, effectively banning involuntary sterilization. Before the amendment, however, more than 16,500 people underwent surgery forced upon them by the state. Some were not even told they won’t be able to have children after receiving an operation. Certain interpretations of the law by authorities also permitted deception and trickery to those who received to comply. The purpose of the Eugenic Protection Law was to “prevent the birth of defective descendants” (Article 1 of the Eugenic Protection Law), originating from the post-war political ideology of “reviving the Japanese race.” The law only applied to those deemed by the state to have hereditary genetic disorders and disabilities, but eventually people with non-hereditary genetic disorders and disabilities, and even some who couldn’t clearly be categorized as disabled, fell victim to the law. Copyright (C) Waseda Chronicle, All Rights Reserved. The original Japanese version of the article was published on Feb. 14, 2018. Waseda Chronicle has started a crowd funding campaign to fund our reporting on this series. We need your support, as we are a non-profit organization. We are also seeking tip-offs or any information on this issue. Please visit our website if you’d like to contact us. Your information could help the victims. *3 The vice health and labor minister at the time was Taishi Miyazaki. He started his career at the ministry 1926, shifting from the health bureau of the now-defunct Interior Ministry. He served as the vice minister from May 8, 1951 to Sep.1, 1953, after holding numerous high-ranking titles such as the director of the insurance bureau. Reference: The 20-year history of the health and labor ministry by the 20-year history of the health and labor ministry editorial committee, the institute of the health labor; The 50-year history of the health and labor ministry (appendix), The 20-year history of the health and labor ministry editorial committee, the institute of the health labor.